Thirty-six teams have entered the PNZ National Doubles Championship in Christchurch this weekend (5-6 November). The field includes 10 former champions: Ian Baker (2004-05), Alan Fletcher (2003), Jared Handford (2011), Seti Mailei (2006), Andre Noel (2009-10-11-14), Tom Paulo (2014), Charles Peni (1999-2000), Junior Puleitu (2015), Richard Swaney (2004-05) and Georgio Vakauta (1999-2000-01-06-08-09-10-15). Twilight Pétanque has restarted at Khandallah. Every Tuesday night from 6:00 pm until the end of Daylight Saving. Note: The clubrooms have since been demolished. Thirty-six teams took part in the nineteenth PNZ National Doubles Championship. 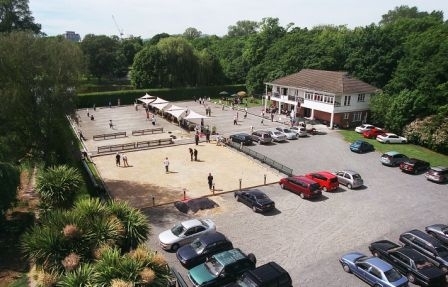 This was the final event to take place at the Christchurch Pétanque club terrain in North Hagley Park. Saturday’s format was a six-round Swiss, which saw 4 teams finish on 5 wins (Charles Peni/Adelys Taraunu, Andre Noel/Tom Paulo, Emile Ferrand/Stephane Montel and Junior Puleitu/Georgio Vakauta). After the barrage round on Sunday morning the teams were split again for the knockout. The top 8 in the Trophy and Plate carried on with the bottom 8 dropping to the Trophy and Plate Consolation section. Richard Swaney, Maurice Belz, Andre Noel, Tom Paulo. The Trophy final featured 2014 Doubles Champions, Andre Noel and Tom Paulo, against 2004-5 Doubles Champion, Richard Swaney, and 2016 Singles Champion, Maurice Belz. Maurice and Richard had the better of the early stages, but Andre and Tom stormed back to take the match 13-8. The Duck Creek Restaurant at Pauatahanui has closed, which medans that another Pétanque Cafe venue is no more. The video of the 2016 PNZ National Doubles Championship final from Christchurch is now on the Wellington Pétanque YouTube channel. Due to the number of the pages (700 and counting) that now exist on this website we have outgrown our free Swiftype search engine. Consequently, a new Zoom search engine from Wrensoft has been installed and is now operating. Indexing of the site will happen at least weekly. 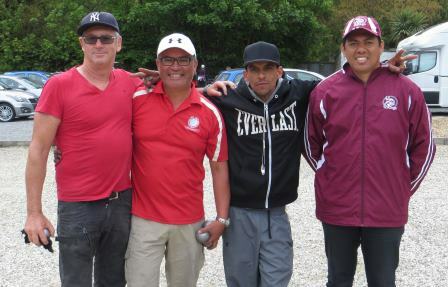 Teams from seven clubs took part in the Champion of Champions Doubles tournament at Silverstream on Saturday. Like the Singles, the tournament was decided in the last round when Enoka and Monica Smiler (Park Avenue) faced Dave Gatchell and John Pallesen (Horowhenua) with both teams on 4 wins. Park Avenue took the game 13-5 to win the title, with Kapiti pipping Horowhenua as runner-up on tie-break. Final results. A full house of 40 players took part in the annual Mêlée at Upper Hutt on Sunday. The weather was kind with only a couple of light showers. The day started with Bob Horton arriving at Maidstone Park at 6:30 am to dig some holes under the border to drain the not inconsiderable amount of water lying on the terrain from the previous day’s rain. By 9:00 am it had drained enough for play to begin. Julian Teni was the only player to record 5 wins (+26). Len Cogger was in second place with 4 wins (+33) and Barbara Nicholls third with 4 wins (+26). Twenty teams have entered the WPA Regional Senior Doubles Championship to be held at the Otaki Pétanque club on Wednesday, 23 November 2016. Player briefing prior to start of play. Twenty teams are taking part in the tenth annual Wanganui East Open Triples. Saturday’s format was the five rounds (60 minutes, plus 2 ends) with the top 8 teams qualifying for the Trophy section. Three teams finished with five wins: Maurice Belz/Myles Cowper/Michael Rocks, Sharon Cannon/Pete Hamilton/Claire Wilson and Yvonne Futcher/Kevin McFadgen/Sheryl McFadgen. The Trophy final featured the top two teams from Pool A. In the morning game, Barbara Johnston, Murray Johnston and Ralph Priddle lead 11-5 against Maurice Belz, Myles Cowper and Michael Rocks at the end of 60 minutes. In the two extra ends, Maurice, Myles and Michael picked up a 3 and 3 to win the match 12-11. The second time around, the contrast couldn't be more dramatic as Maurice, Myles and Michael won the match 13-0. The Plate final featured two teams from Pool B. Sharon Cannon, Pete Hamilton and Claire Wilson beat Team Toyne (Ben, Maree and Niko) 13-2. The Bowl was won by Wayne Goodman, Shirley Madgwick and Trish Smart. The video of the 2016 Wanganui East Open Triples final is now on the Wellington Pétanque YouTube channel. Nine teams have entered the Khandallah 3 Boules Triples to be held on Saturday, 26 November 2016. An extra team or three to avoid the Bye would be appreciated. A record eight WPA members have been named in the NZ Open team to take part in the 2017 Trans-Tasman match in Adelaide (18-19 March). This is the two more than six selected in 2014. Ian Baker (Herne Bay), Richard Browne (Ashburton), Myles Cowper (Hataitai), Jean-Pascal Cuer (Herne Bay), Michael Rocks (Khandallah), Richard Swaney (Herne Bay). Stephen Frampton (Kapiti) is the non travelling reserve. Sharon Cannon (Wanganui East), Ann Hogg (Otaki), Annick Le Guen (Kapiti), Shirley MacDonald (Otaki), Christine Strichen (Wanganui East), Claire Wilson (Wanganui East). Ruby Vakauta (Vikings) is the non travelling reserve. 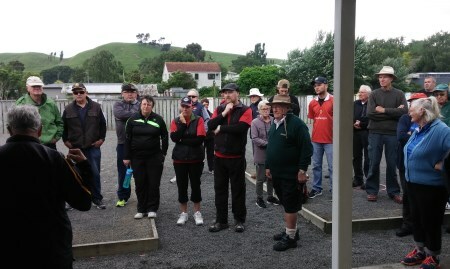 Twenty teams took part in the Regional Senior Doubles Championship held at the Otaki Pétanque club. In the Trophy final, Sharon Cannon and Sheryl Parslow beat Marc Khull and Shirley MacDonald 13-4. The Plate final was won by Dave Gatchell and Pete Hamilton 13-10 over Doc Murray and Dave Wilmshurst. Sue Gurr and Shirley Madgwick beat Dave Kitchener and Lynne Shepherd 13-9 to win the Bowl. 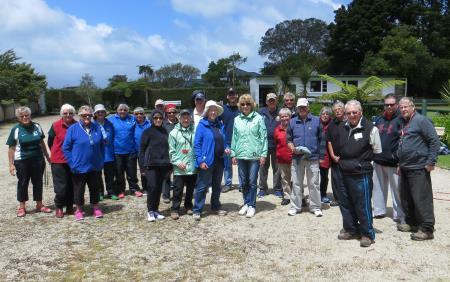 Participants in the Khandallah 3 Boules Triples. 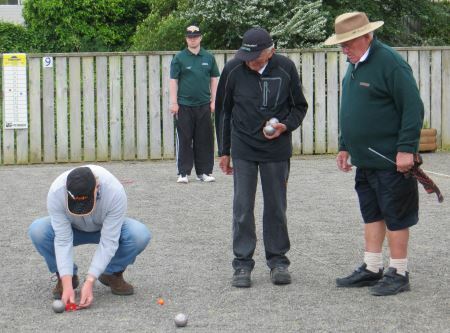 Eight teams took part in the Khandallah 3 Boules Triples after one team had to pull out due to ill health. The format was a five round random draw and after three rounds Kapiti Belles (Kathy Gatford, Jo Maxwell and Lynne Shepherd) were the only undefeated team. The Belles slipped up in Round 4, which allowed Happy Landings (Hayden Boulton, Michael Rocks and Peter van Heusden) to catch them. Both teams won their final game, but it was the Belles who headed the standings on tie-break. Eight Wellington Region players are included in the twenty-four teams that have entered the National Senior Doubles Championship in Dunedin this weekend (3-4 December). The field includes seven former champions: Ian Baker (2014), Clive Bartleet (2012-13), Bob Bridge (2009-10-12-13), Pete Hamilton (2011), Graeme Morris (2011), Bill Peachey (2009-10-15) and Ray Pierce (2015).